28 to 33.99 square inch custom die cut magnets - outdoor & car magnets 30 MIL will allow you to take your campaign around the town without escalating your budget or fuel charges. There are millions of ways you can present your brand information and you can experiment them over these die cut magnets. These large promotional magnets can be customized with any regular or special business information that you want to share with your customers. Make sure you select the appropriate distribution method, rest these custom die cut magnets will take up their course! Order yours today! 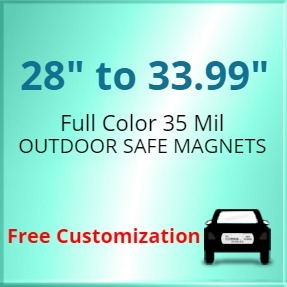 Request a quote to know savings that you can make on wholesale ordering 28 to 33.99 square inch personalized die cut magnets - outdoor & car magnets 30 MIL.